This skirt has been in the making (and to be honest, has been finished as well) for a while. I´ve wanted a teal pencil skirt since last year, and I bought the fabric in December a year ago. Then the fabric just layed there for a month or five, until I finally came around to make it this summer. Unfortunaltely, I didn´t really love the end result, so I chopped off some of the length, and I finally got myself a really wearable skirt that I wear alot. The fabric is cotton sateen, and it has quite a lot of stretch in it. I used BurdaStyle pattern 03-2009-104. Oh, and by the way, I wear it together with one of my Tamanegi-Kobo Heather sweaters. The skirt is actually quite high waisted, and it got pockets. For me, that is just perfect. Finding pencil skirt patterns with pockets is not the easiest! 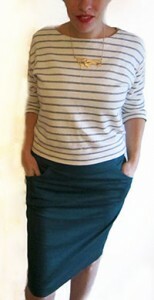 I definately recommend this skirt pattern, it is suspiciously alike another Burda skirt, the Kasia skirt. Kasia had her hayday back in 2010, but she´s still a classy lady, and it´s free on burdastyle.com, so go fetch! By the way, I´ve changed a little on the blog design, I hope you´ll like it!